Louis Pitschke is the quiet type. But he roared to first place in the men’s B dual slalom during weekend collegiate mountain bike races hosted by UNR. He finished second in Sunday’s downhill event. 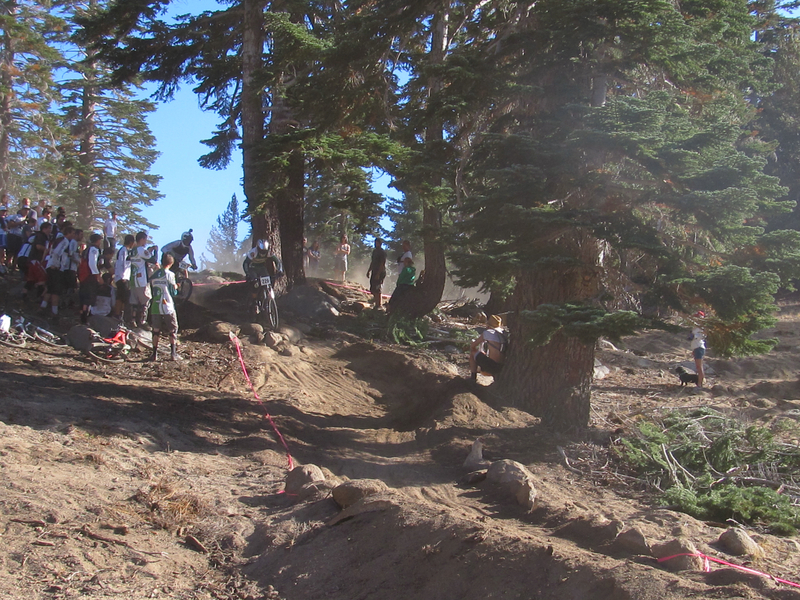 Louis Pitschke charges ahead of another rider to win the men’s B dual slalom on Saturday at Sky Tavern Bike Park near North Lake Tahoe. Photo by Teri Pitschke. Pitschke wasn’t the only HSU cyclist at the top of the podium in the Sky Tavern Sufferfest. Steven Pearl crushed the men’s A short-track race on Sunday, crossing the line first in a strong, competitive field. Pearl finished second in the cross country race and second in the men’s B dual slalom on Saturday– putting him on the podium in all three events that he raced this weekend. Other strong racing by HSU cyclists in the Sufferfest: Joey Wright finished 8th in the men’s C ST and 14th in the XC; Justin Graves 8th in the men’s A DH and 11th in the XC; Dylan Wright 21rst in the men’s A DH; Marina Marcroft 6th in the women’s B ST; Justin Gore 7th in the men’s C DH; and Clayton Kelley with an 11th place in the men’s C DH. This entry was posted in Mountain Bike Season 2012 and tagged clayton kelley, joey wright, justin gore, justin graves, louis pitschke, marina marcroft, Sky Tavern Sufferfest, steven pearl. Bookmark the permalink.